While the Cold War unfolded following World War II, the sources of its tension can be found significantly earlier. During the 1930s, most politicians in the West viewed Nazi Germany and Soviet Russia in similar terms. While Nazism and communism occupied opposite ends of the political spectrum, they viewed both ideologies as dangerous and threatening. Adolf Hitler and Joseph Stalin may have hated one another but to the West they were mirror-image dictators, each guilty of political oppression, brutality and disregard for humanity. In August 1939 Hitler and Stalin signed a non-aggression treaty, promising not to declare war on each other for a decade. When Hitler’s forces invaded western Poland in September, triggering World War II, Stalin’s Red Army was invading and occupying Poland from the east. This development horrified Western observers, who feared the two dictators had reached an agreement to divide and conquer Europe. In reality, the Nazi-Soviet non-aggression treaty was simply a stalling tactic. Hitler intended to break the treaty and invade Russia, probably sometime before 1943, while Stalin was aware of his intentions. Against the advice of his generals, the Nazi leader ordered an attack on the USSR in June 1941. This pushed Stalin and his country into an unlikely but strategically important military alliance with the Allies. During World War II, Stalin participated in several high-level conferences with American and British leaders. The first of these summits was held in Tehran, Iran in November-December 1943; a second was held in Yalta in February 1945. At both summits, Stalin shared the conference table with two men who had once reviled him as a tyrant: Franklin Roosevelt and Winston Churchill. 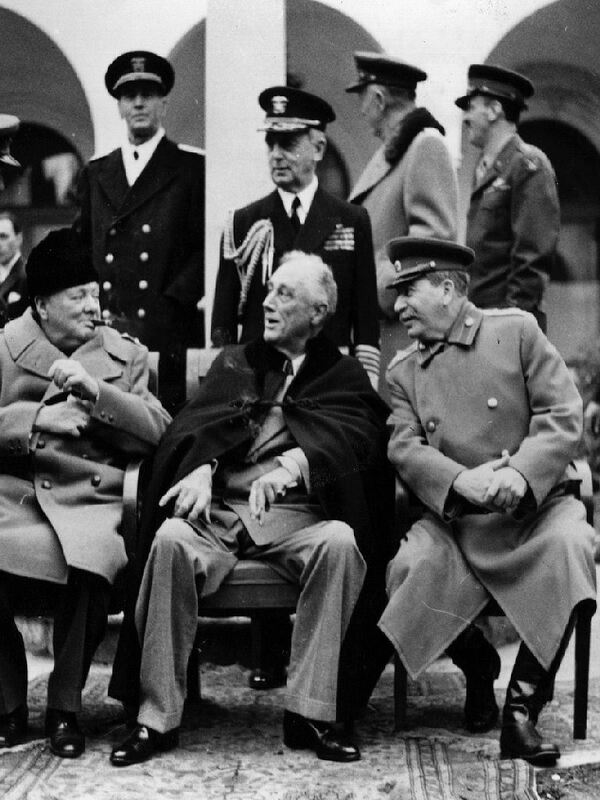 By the Yalta conference, the level of co-operation and friendship between the so-called ‘Big Three’ had reached its strongest level. The Nazi invasion of the Soviet Union had stalled and then failed; the D-Day landings had been successful. By early 1945, Hitler’s forces were just weeks from defeat as Soviet and Allied forces moved into Germany from east and west respectively. By the Yalta conference, the Allied leaders had turned their attention toward organising the post-war world and rebuilding war-ravaged Europe. Personal relations between Stalin, Churchill and Roosevelt were mixed. Roosevelt enjoyed amicable relations with Stalin, at least superficially, and was optimistic about his ability to manage the Soviet leader as an ally. 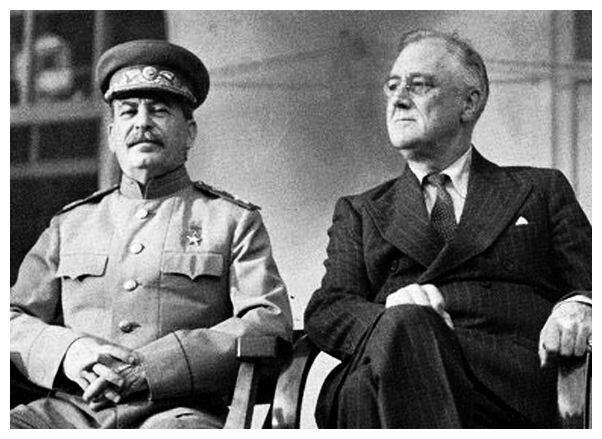 Aware that Roosevelt was in poor health, Stalin gave him a warm welcome in Yalta and expressed hope that a US-Soviet alliance might continue in peacetime: “I want to drink to our alliance, that it should not lose its character. I propose a toast to our alliance, may it be strong and stable.” Roosevelt also showed empathy for the significant loss of life and property sustained by the Soviet Union. More than 20 million Russians had been killed, another 25 million rendered homeless, 7 million horses killed and 65,000 kilometres of railway line destroyed. Stalin suggested a reparations figure of $10 billion and Roosevelt supported his claim. Not all shared Roosevelt’s hopeful attitude towards Stalin. Winston Churchill showed some respect and admiration for Stalin (he once observed in private that “I like this man”) but his views about Soviet communism and the workability of a post-war alliance were consistently pessimistic. Churchill communicated with Stalin much less frequently than did Roosevelt. The British prime minister was cautious about revealing too much to his Soviet counterpart and the two occasionally exchanged sarcasm or jibes. This distance is hinted at in press-call photographs of the wartime conferences, where Stalin and Churchill were usually separated by Roosevelt. For Churchill, allying with Stalin to defeat Hitler was little more than choosing between the lesser of two evils. In the end, [Churchill] knew well that when he dealt with the Soviet tyrant he dealt with the “devil” and that the Soviet system was vile. Here lay the crucial difference between Churchill and Franklin Roosevelt. Churchill proved willing throughout the war to negotiate geopolitical deals with the Soviets, but Roosevelt rejected this approach and ambitiously aimed higher. He hoped to domesticate and to civilise the Soviet “devil” to adopt the American way. “Churchill”, as Patrick Glynn persuasively argued, “…understood the essential nature of the Soviet regime and of Stalin. Roosevelt, whatever his other virtues and abilities, never did. The main issue on the table at Yalta was the future of Poland. Both Roosevelt and Churchill were acutely aware that Stalin had double-crossed the West before over Poland. Stalin’s 1939 pact with Hitler included a secret clause to divide Polish territory between Germany and the USSR. At Yalta, Stalin was quite frank in his discussions about Poland. He admitted liability for entering into a pact with Hitler but justified it by explaining that Poland had often been used as a corridor for attacks on Russia. It was therefore important for Russia to have a stake in Polish territory, Stalin said, to ease fears of invasion from the west. Roosevelt and Churchill accepted this and agreed to let the Soviet Union retain keep the eastern half of Poland. In return, Stalin promised to permit free elections in Poland. This agreement drew stinging criticism back in Britain, where Churchill was accused in parliament of ‘selling out’ the Poles. The violation of Polish sovereignty had triggered Britain’s declaration of war on Germany – and now Churchill had “bargained it away” at Yalta. Stalin had no intention of honouring his promises on Poland. Instead, Soviet occupying forces in Poland delayed elections there while they nullified opposition. In March 1945 they arrested 16 Polish political leaders, conducted a show trial in Moscow and detained them in a labour camp. The elections weren’t held until January 1947, by which time Soviet agents had engineered a victory for local communists. Roosevelt soon realised that he had been wrong to trust the Russian leader. On April 1st 1945, the US president wrote Stalin a firm letter of protest over the lack of democratic developments in Poland. “I cannot conceal from you the concern with which I view the development of events… since our fruitful meeting at Yalta,” Roosevelt said. He pointed out the “discouraging lack of progress” in the implementation of a Polish democratic government, and said that “a thinly disguised continuance of the present Warsaw regime would be unacceptable and would cause the people of the United States to regard the Yalta agreement as having failed”. Two weeks later Roosevelt was dead, following a massive stroke brought on by long-term illnesses, his immense workload and the stresses of office. Allied leaders met again in Potsdam, Germany in July 1945. By this time, the situation had changed significantly. The war in Europe was over and the war against Japan was in its final weeks. Soviet forces occupied much of eastern Europe including the Baltic states, Poland, Hungary, Czechoslovakia and Romania. There had been no free elections held or scheduled in Poland, which was still occupied by Soviet forces. Roosevelt had been replaced by his vice-president, Harry Truman, a no-nonsense war veteran more interested in containing the spread of communism than building a productive relationship with Stalin. Churchill himself was replaced by Clement Atlee midway through the Potsdam conference, after losing a general election in Britain. Western leaders were by now under no illusions about Stalin, so the negotiations at Potsdam were much more cautious and restrained. Germany would be occupied by the Allies (US, Britain, France and Soviet Union) in four discrete zones, for an indeterminate period of time. Allied military commanders would act as the government in their respective zones. Germany would be ‘de-Nazified’, demilitarised and democratised. Members of the Nazi Party would be removed from government and public offices. Germany would eventually regain its sovereignty and remain as a single nation. Germany’s armed forces would be scaled down, while factories and plants capable of producing armaments would be deconstructed or permanently converted to other uses. The German economy would be converted to agriculture and light industry, with production and exports strictly controlled by the Allies. Restoring democratic institutions in Germany was identified as a long-term goal. The borders of Germany would be redrawn, leaving her 25 percent smaller than in 1937. European nations formerly annexed by Germany, such as Austria and Czechoslovakia, would be returned to their original peoples and German citizens living in those areas would be relocated to Germany. The borders of Poland would also be redrawn. The Soviets would retain control of Polish territory they seized in 1939, while sizeable portions of eastern Germany were given to Poland. The entire Polish nation, in effect, was shifted to the west. The Allies recognised a coalition of parties in Warsaw as the official government of Poland. With Russia in desperate need of resources, Stalin demanded massive war reparations from Germany. The Potsdam conference agreed the Allies should receive war reparations totalling $20 billion. These reparations would be taken from their respective occupation zones, in the form of goods and machinery. The wartime conferences at Yalta and Potsdam revealed fundamental differences that contributed to the development of the Cold War. Stalin wanted a Soviet sphere of influence in eastern Europe, ostensibly to protect Russia from a western attack. The Soviet leader wanted to divide and cripple Germany so that it could never again threaten his country; he also wanted massive reparations from Germany to help rebuild the war-ravaged USSR. The Americans and British were uncertain about what to do with Germany – but they wanted European nations to have political systems and governments based on self-determination and democratic principles. But Stalin was a cunning negotiator – and one who couldn’t be taken at his word. He had a fundamental distrust of Western leaders and was paranoid about their intentions toward Russia. Stalin made promises he had no intention of keeping, simply so he could buy time to establish Soviet-controlled regimes and satellite states in eastern Europe. This encroachment established the first battleground for the Cold War: Europe divided by the Iron Curtain. 1. Before World War II, Allied leaders viewed Joseph Stalin as a malevolent dictator, in a similar vein to Adolf Hitler. The Nazi-Soviet Non-Aggression Pact (1939) only confirmed these fears. 2. In 1941 the Allies entered into an unlikely alliance with Stalin. Allied leaders dealt with him at conferences in Tehran (December 1943), Yalta (February 1945) and Potsdam (July 1945). 3. The organisation of post-war Europe was discussed at these conferences. At Yalta, Stalin promised to allow free elections in Poland, provided the USSR retained large areas of eastern Poland. 4. Stalin reneged on this promise. 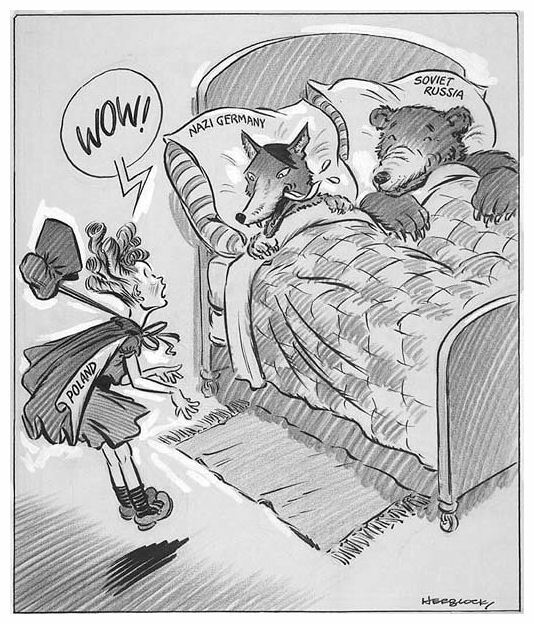 With the death of Roosevelt, this led to greater suspicion about Soviet motives. As a result, the Potsdam conference was conducted in a less conciliatory tone. 5. The Potsdam conference finalised the post-war occupation and division of Germany, as well as the future of Poland – but the tensions, animosity and mistrust that emerged during these wartime negotiations contributed to the unfolding Cold War. 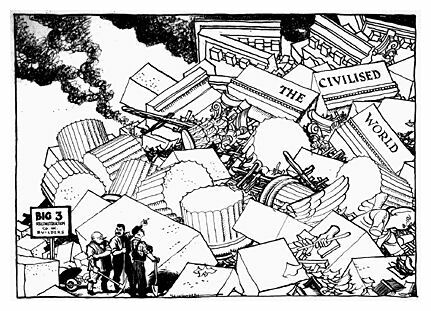 J. Llewellyn et al, “Post-war divisions”, Alpha History, accessed [today’s date], https://alphahistory.com/coldwar/post-war-divisions/.